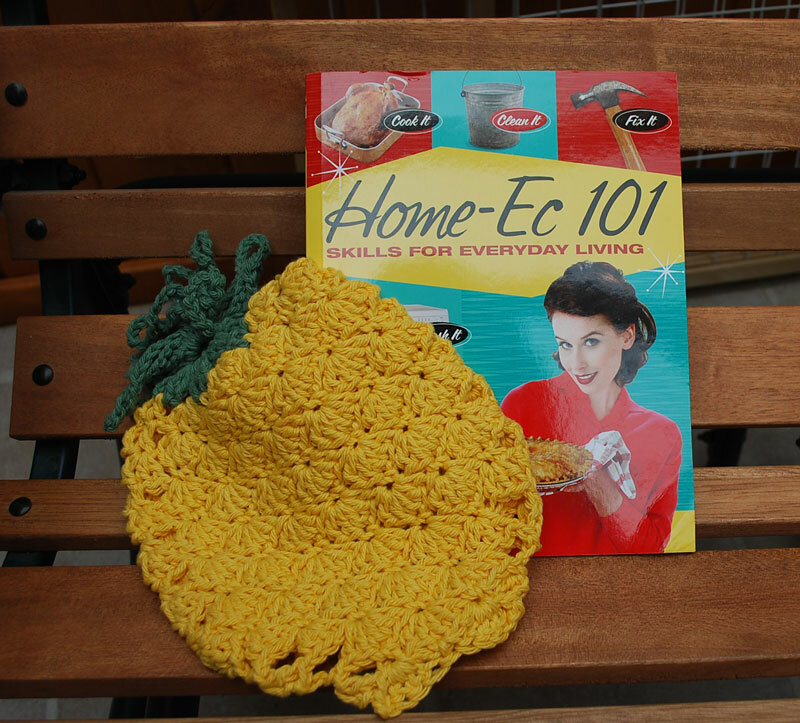 A copy of the book Home Ec 101 and a lovely pineapple potholder. I'm really looking forward to sitting down with the book and honing my home ec skills. And sorry, Vera, but I think the potholder is way too pretty to use and will probably end up decorating my kitchen. Thank you very much!! And speaking of blogiversaries – I have one coming up this week too! 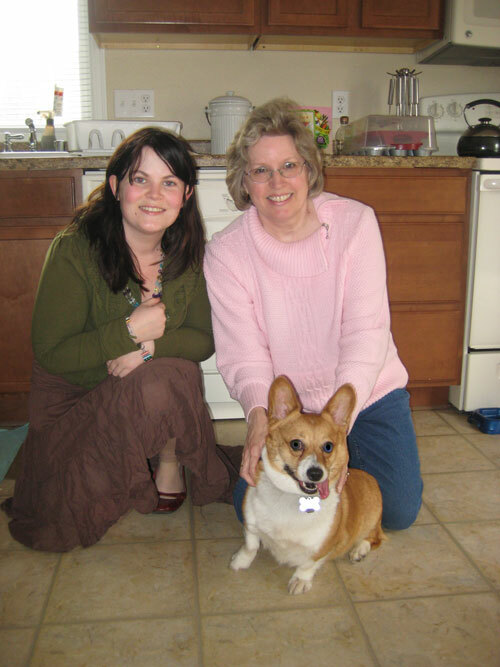 Can you believe it's been seven years since I started this blog? So much has happened in that time. During those first few posts I reported on my son's visit with his lovely girfriend – her first visit ever to the United States. At the end of the visit they announced their engagement. One wedding and two granddaughters later I can't even imagine life without her! So, I guess to celebrate, I should have a contest too. Send me a comment to this post by April 30th and I'll enter you in the contest. On May 1st (or thereabouts) all comments will be numbered and my random number selector (aka hubby) will pick a number. 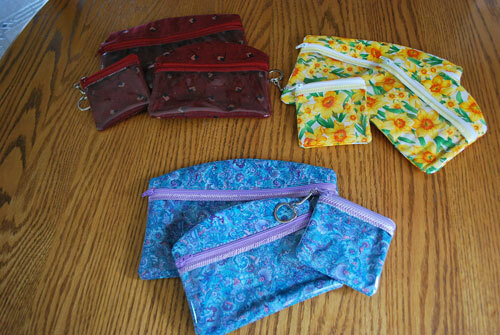 The winner will be able to go to my etsy shop and pick out any one item (sets count as one item, so think big!). The yarn is a Berroco, but I can't seem to find the ball band. Plain Jane socks knitted on size 0's. Front and back done and joined at shoulders. 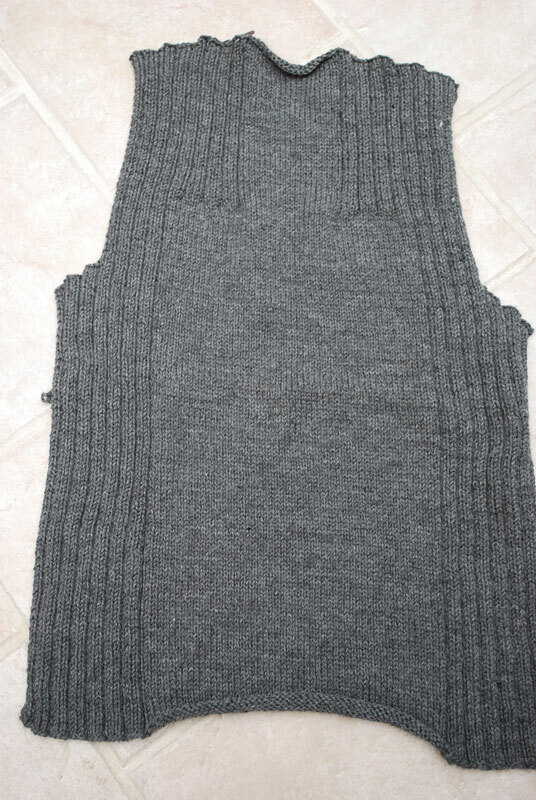 All that's left is to sew the side seams and a few rows of garter stitch around neck and armholes. Anyone want to take a guess at how long I'll procrastinate on this one? We finally seem to have turned a corner toward springtime here in the Pacific Northwest. Today is supposed to be in the upper 50's and tomorrow we may even break 60 – with sunshine no less. Then rain for Easter, but that's pretty normal around here. I hope all of you have a blessed Easter! There was a big, fenced in backyard and lots of love evident all around. As sad as it was to say goodbye, we knew Angel was where she was meant to be. 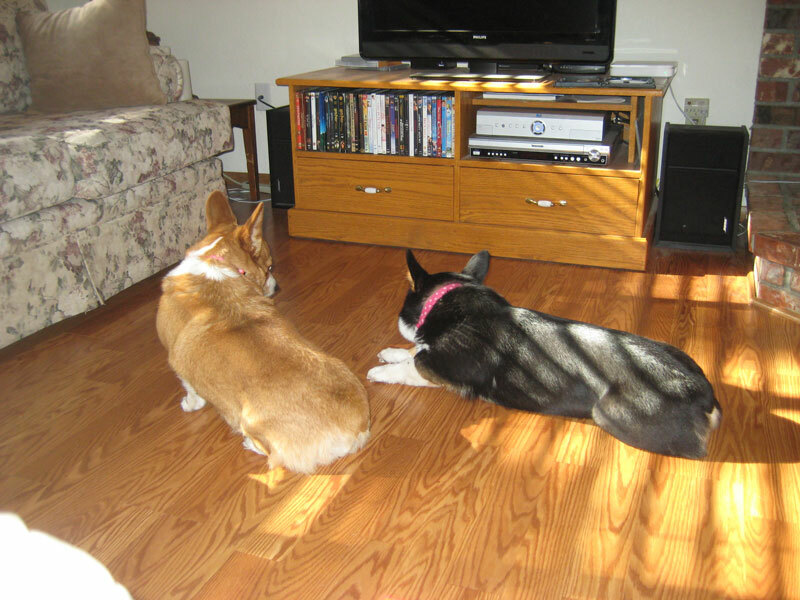 We've been in contact with Chae all weekend and Angel is adapting well and is already a member of the family. I think some people thought we were a little crazy to drive all that way for one little dog, but we just knew this was the right thing to do for little Angel. We came home to a very relaxed and happy Maggie, as well! 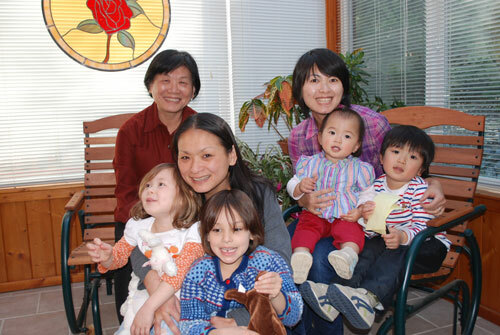 Today was a wonderful, hectic, crazy day as we welcomed Abby's sister, two children and her mom for a family get together. Thank goodness for sunshine and dry weather as the four kids and Maggie had a wonderful time chasing each other around the yard. Both of Abby's sister's children really took to Maggie. Ryo, the little boy liked kicking Maggie's ball so she could chase it and Nana, the little girl just liked to sit and pat her. By the end of the day we had four exhausted kids and one tired puppy! The long road trip provided lots of time for knitting. 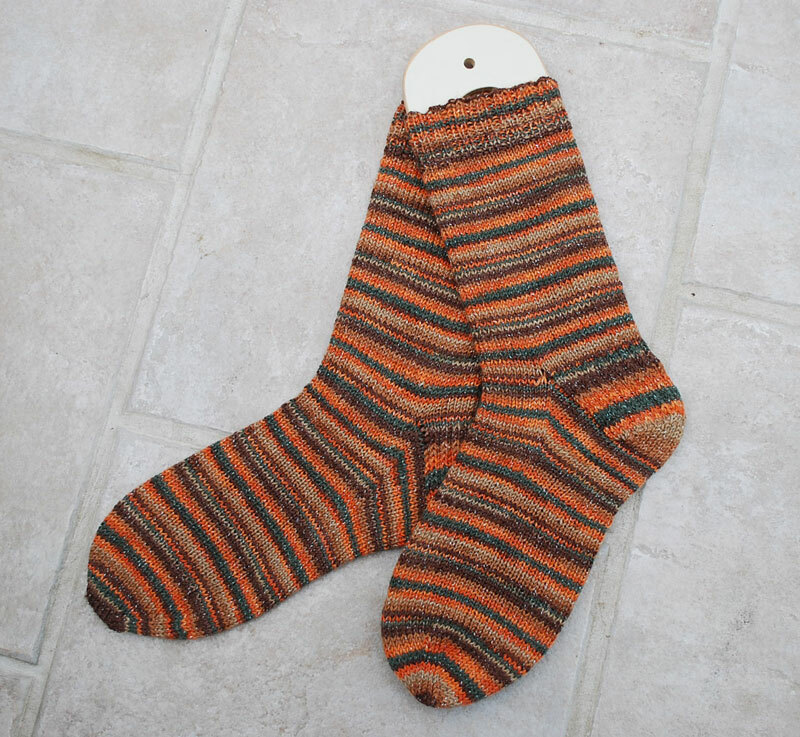 I finished a pair of socks and the back of hubby's Cambridge jacket. I promise photos next time. For now – I'm just going to sit back and relax! We've had a couple of scary knock-down-drag-out fights. Our biggest worry, other than the complete lack of peace in our house right now, is that when the girls visit they would be at risk of getting in the middle of a dog fight, and we can't have that. Happily, Ravelry came to the resuce. I'm in a Corgi group and someone there knew of a Raveler in Spokane who has been looking for a Corgi! I contacted her and it is a perfect situation! They are a young couple with no other dogs. He used to be a dog trainer before going into the Air Force. They have a big fenced in back yard and are just waiting for a Corgi to love. Friday we will head on over. It's 6 hours over and 6 hours back (with gas at almost $4.00 a gallon! ), but it is well worth it to us to have Angel in a good home. She has so much to offer the right family; she's just too insecure to fit in with another dog at this time. They haven't been flying off the shelves quite yet, but I have gotten a few special orders. I have a feeling Christmas will be busy, as these will make great gifts. But do send all your knitting friends to the shop. I love how you can see through these cases so you know exactly what you have in them. My evenings have been spent working on In Dreams. Unfortunately some of that time has been spent tinking! Oddly enough, I don't seem to have any problem with the middle part, which is very complicated. I keep making mistakes on the outer border, which is the same 8 rows over and over. 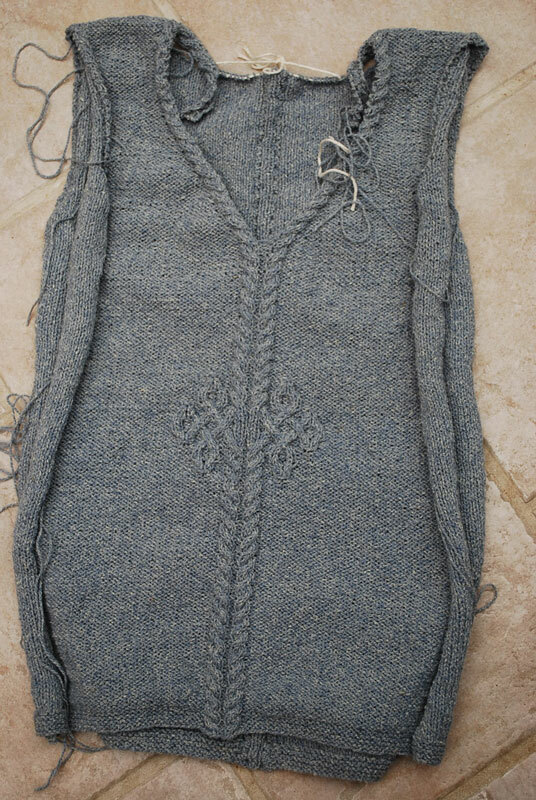 But when you've forgotten a bind off or a double yarn over and don't notice it until the next row, or even a few rows later, it is impossible to fix. Everything, including the middle rows, have to come out. You'd think I would learn to pay more attention on those borders, but you might just be wrong. I have frogged the Monkey socks I was working on. 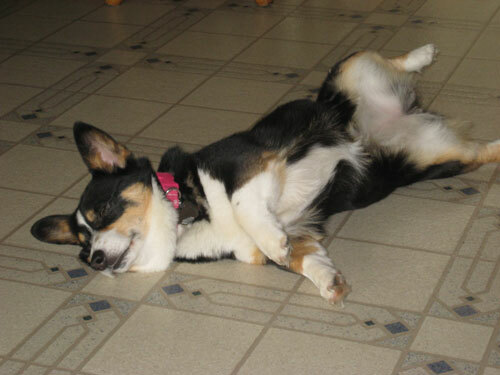 For one thing, I've decided that KAL's with deadlines are just not for me. I don't like knitting under pressure. I do have as my goal knitting all of the socks in Knit, Sock Love, but will do it at my own pace. And I've also decided that I really do not love the Monkeys in such a variegated yarn. Most of the Monkeys seem to be done that way, but I think in the future I'm going to save my patterned yarns for Plain Jane socks and stick to solids and semi-solids for Cookie's socks. I've decided to give spindle spinning another try. I ordered this on the recommendation of Allison (see her picture in my last post). She is a wonderful spindle spinner. I had mentioned to her my frustration with spindle spinning – the cheaper spindles are very difficult to handle, but I didn't want to splurge on a more expensive one just to find I thoroughly hate it. She suggested the student spindle from The Bellwether. It is very inexpensive, but a good quality. I've been practicing a little and I think I'm getting a little better. Although my yarn is still crap, at least I'm not dropping it as much! I like to think that's because I'm improving and not just because my reflexes at catching it are getting better. Spring is trying to fight its way into the Pacific Northwest. This can be a frustrating time of year – we're ready for spring, but it's not quite ready for us. However, when looking at weather in other parts of the country, I have absolutely no complaints! The Northeast still has a foot of snow on the ground, the south and midwest have temps in the 80's and tornadoes. The lake in my backyard is not looking too bad at this point. Ok, it's official – my Etsy shop is open. 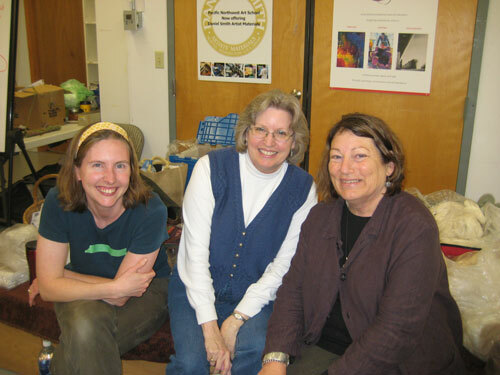 Look for me as IslandHeirlooms! My mad social whirl continued this weekend with the annual Spin In here in town. For a small, sleepy town, we draw a huge crowd for the two-day event. And do you think I thought to take pictures? Nope! In my defense I was in charge of registration and things got pretty intense. Over 200 participants registered – most of them all at once, I think! The merchant mall was unbelievable. Drat – I still can't believe I didn't take a single picture. Some small fiber stash enhancement took place. No picture there either, but I promise next post. To do it now would entail getting out of my recliner and I'm still resting! That's Allison pictured with us. 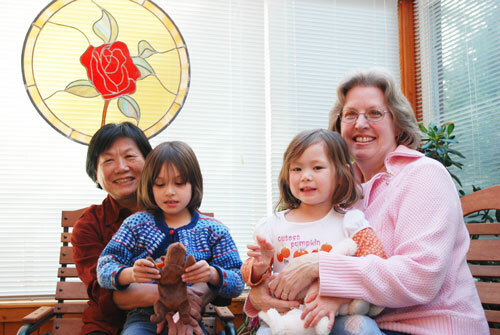 You might know her on Ravelry as SunnyDay. She is a spindle spinner extrodinaire and she coaxed me into ordering a spindle. I'm sure Lorette will be pleased at that! The workshop was well, well worth it. By the end of the day I was spinning 2 ply laceweight with ease. I could also spin super bulky, although I doubt I'll ever want to do that. 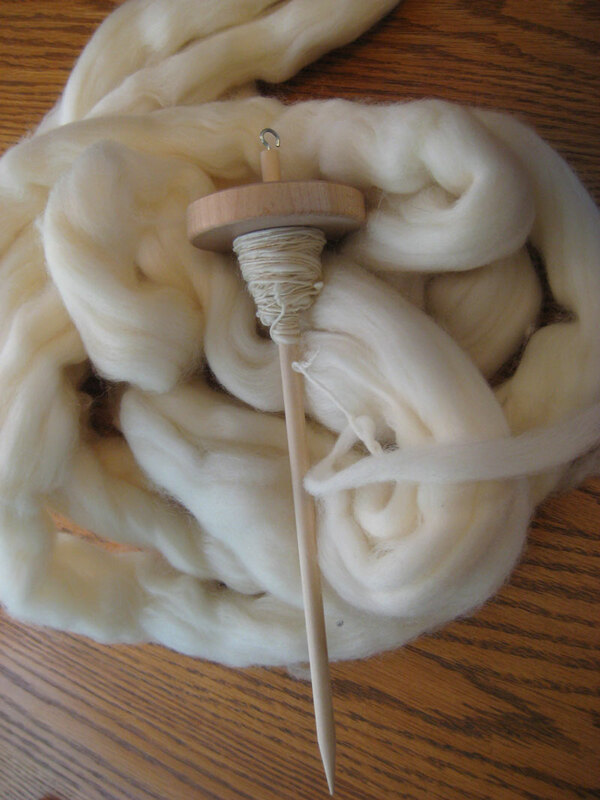 We spun cashmere, several kinds of silk, corriedale and a rambouillet/kid mohair mix. By the end of the day I was totally and utterly exhausted and my brain hurt, but I learned enough to keep me going for a long time. 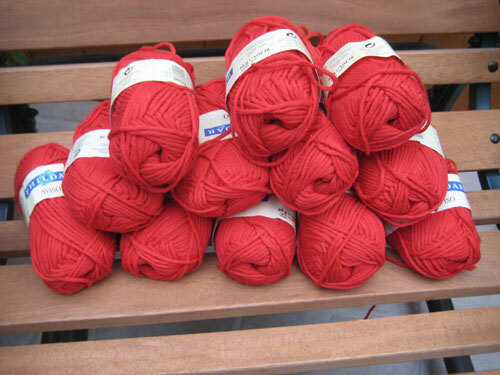 Lorette had a contest on her blog and I won all this lovely Phildar Aviso – 60% cotton, 40% acrylic. It looks a little hot pink in the picture, but is really a bright, rich red. What? You say I should wait and take a picture in daylight? Fat chance. We're building an ark even as we speak. Anyway, I'm not sure yet what I will do with it. For some reason the thought of a lovely hooded scarf appeals to me. Something to wear while walking the dog. And speaking of dogs, it does not seem likely that we will be keeping Angel. Maggie seems to tolerate her well enough, but Angel is extremely jealous of Maggie. She does not want her anywhere near us, and is constantly confronting her and provoking a reaction. Maggie will try to go somewhere else, but eventually comes out fighting. We've had a couple of scary knock down drag out fights. Things do seem to be getting better, and if we never had kids over I might be prone to tough it out. But I don't know that I could ever trust the two of them around the girls. If the excitement level got high (as it does with the girls around), I'm afraid they might get between the two dogs. We're looking at options now, including a Raveler in Spokane who may be interested. I'm saddened that it didn't work out, but at this point neither dog is happy. Angel is so sweet and loving, she deserves a home where she can relax and soak up the affection. 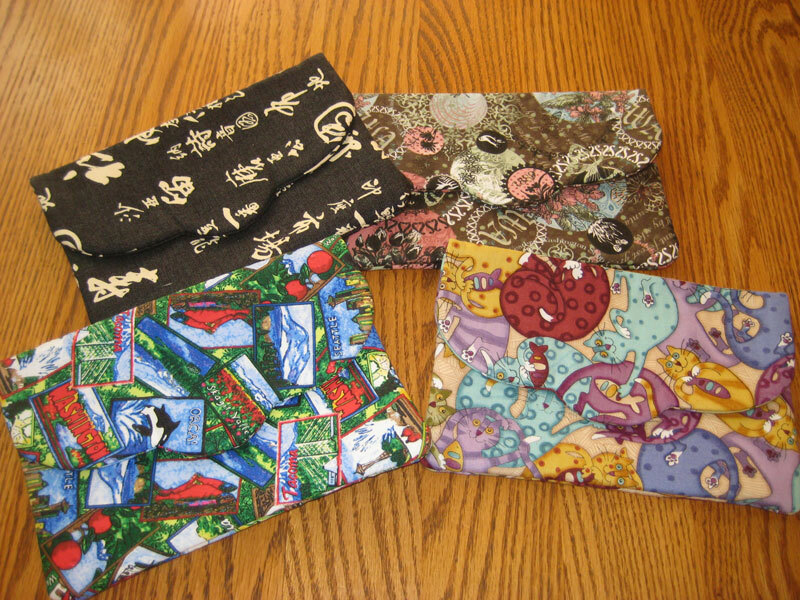 In between refereeing fights, I've become obsessed with making these cute little cloth and vinyl bags. The largest is 9×5, the middle 6×4 and smallest 3 1/2 x 3/12. 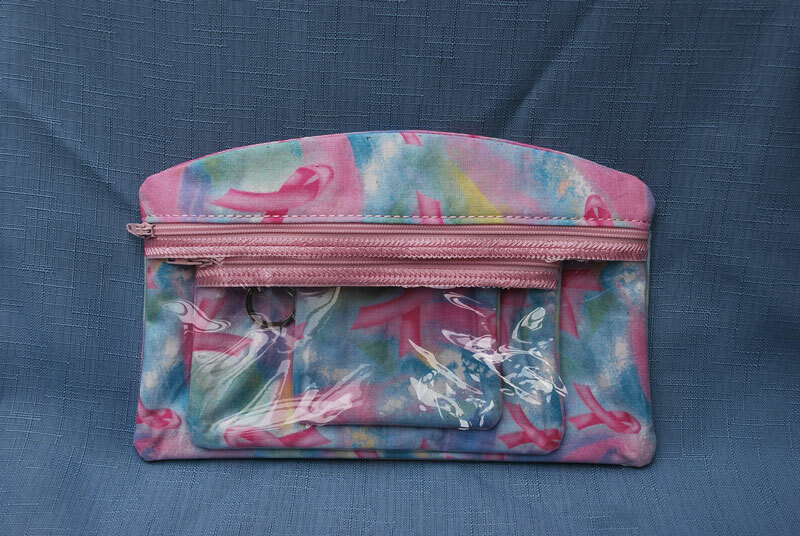 They have a clear vinyl front and would be great for so many uses – make up bags, knitting and sewing notions, spinning accessories, you name it. 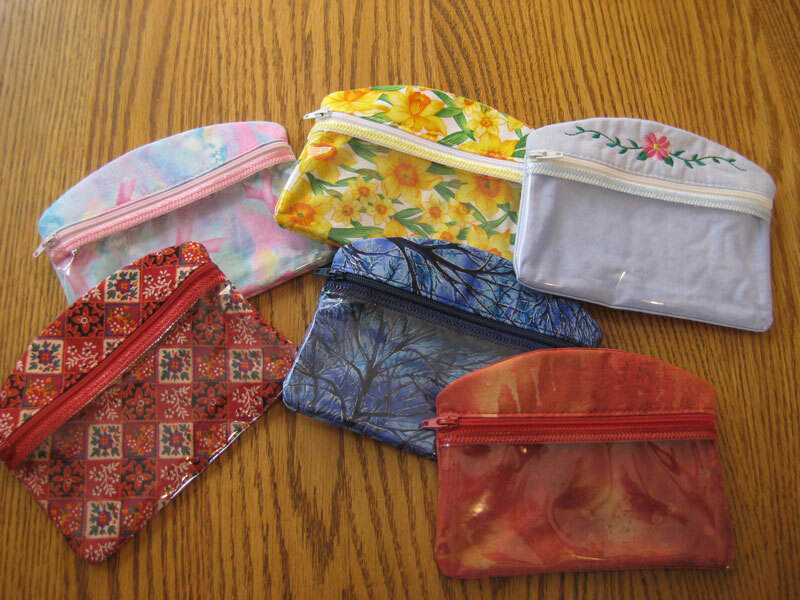 The small one comes on a key chain and can hold a small items for your purse – hand sanitizer, medications, change. You can even put in a few dog cookies in the front and a couple of plastic bags in the pocket on the back for your daily walk with your doggies. In fact, I like making them so much that I am going to open my own Etsy shop to sell them. I'm hoping to get the shop up as soon as I get some good daylight to take decent pictures. You can look for my shop under "Island Heirlooms". I'll be selling them in sets (which would make great gifts) or as singles. I think I've finally come to the end of all my exciting trips. In all honesty, I am more than ready to stay home and putter for a while!